Each October the Basil Hetzel Institute for Translational Health Research holds TQEH Research Expo (formerly known as TQEH Research Day) which provides researchers in training the opportunity to gain valuable experience in delivering an oral or poster presentation before a broad audience. The work presented at Research Expo must have been substantially undertaken at the Basil Hetzel Institute, The Queen Elizabeth Hospital and not have been previously presented at a TQEH Research Expo. To view the slideshow from the 2018 TQEH Research Expo below, click on the left and right arrows on the sides of each image. The 2018 TQEH Research Expo Program Booklet can be downloaded here. 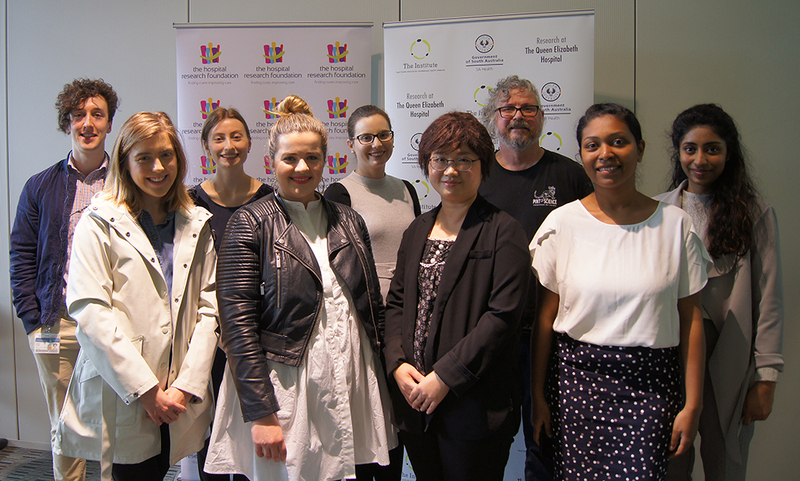 L-R: Clementine Labrosciano, Rachel Goggin, Anna Nolan (CFO, THRF), Ashley Twigger, Anupam Gupta, Prof Guy Maddern (Director of Research, TQEH), Lisa Cherian and Namfon Pantarat (absent: Giri Krishnan). 5 prizes worth $1000 each were awarded in the following categories: Honours & Summer Vacation Students, Junior PhD Students (Laboratory), Senior PhD Students (Laboratory), Clinical Trainees and Clinical Higher Degree Research Students. The following organisations are thanked for sponsoring the 2018 TQEH Research Expo. The Hospital Research Foundation, The University of Adelaide (Faculty of Health and Medical Sciences), The University of South Australia (School of Pharmacy and Medical Sciences), Southern Cross Science, ThermoFisher Scientific, Lonza, Beckmann Coulter, Eppendorf, the Australian Genome Research Facility, Abacus dx and Coherent Scientific. If you would like to find out more about sponsoring the 2019 TQEH Research Expo please email Kathryn Hudson. Enquiries about TQEH Research Expo can be directed to Lisa Leopardi, Chair of TQEH Research Day Organising Committee (2018 committee members are listed below). 2018 Call for Abstracts has now closed. Deadline 5pm Monday 20 August, 2018.
please read these Abstract Guidelines before submitting your abstract. In addition, the Abstract Scoring Template is intended to assist in the preparation of your abstract. Abstracts that do not meet the above criteria will be rejected. L-R: Alex Shoubridge, Maddison Archer, Mian Ooi, Sathish Paramasivan, Anna Nolan (CFO, THRF), Prof John Beltrame (Director of Research, CALHN), Fiona Chan, Chris DeFelice and Sean Mangion. Congratulations to the 25th Anniversary of TQEH Research Day’s Prize Winners (L-R: Ben Thurston, Scott Ellis, Professor Guy Maddern (Director of Research, TQEH), Dijana Miljkovic, Vasilios (Bill) Liapis, Vahid Atashgaran and Bahador Assadi-Khansari). TQEH Research Day 2016 took place on Friday 21 October. Prize winners and names of sponsors can be found in the table below. The 2016 Plenary Lecture was given by the CEO of the NHMRC, Professor Anne Kelso AO. The TQEH Research Day Programme 2016 includes abstracts for all poster and oral presentations. The Plenary Speaker for the 2016 TQEH Research Day was Professor Steve Webb, Senior Staff Specialist, Intensive Care Medicine, Royal Perth Hospital & Clinical Professor University of Western Australia & Monash University. We thank the 2015 sponsors of TQEH Research Day: The Hospital Research Foundation for their ongoing support. The University of Adelaide and the University of Adelaide for providing $1,000 for Oral Presentation Prizes, and the Committee of Graduate Studies for covering the costs of flights and accommodation for the plenary speaker. Additional companies who provided financial support and trade displays in 2015 included Interpath Services, Qiagen Pty Ltd, Thermo Fisher, Eppendorf, Pacific Laboratory Products, Merck Millipore, Southern Cross Science, Beckman Coulter, Coherent, Lonza and LabGear. We thank everyone for their involvement in a most successful event!